The advancement of particle accelerators is closely linked to technological progress and novel methods. Early on, in the 1930s, emerging radar technology made powerful high-frequency generators available, which enabled the first high-frequency particle accelerators. Modern particle accelerators use a wide variety of technologies and methods benefitting from, but also inspiring, completely different areas of science and industry. KIT researches and develops cutting-edge technology in many disciplines and institutes. This is the best prerequisite for the development of novel, innovative technologies for the accelerators of the future. KIT technologies are already of great importance for todays, currently progressing and future accelerators. The infrastructures Karlsruhe Research Accelerator (KARA), KIT short-pulse linac test facility and THz source (FLUTE), Magnet Characterization Facilities (MCF), electronic packaging and interconnects center (AVT), “KIT ASIC and Detector Laboratory” (KIT ADL) and cryogenics laboratories contribute to the new concept for accelerator research at KIT in the framework of the KIT Accelerator Technology Platform. ATP combines accelerator-relevant infrastructures, technologies and research in a unique way, taking advantage of the wide-spread expertise of KIT institutes to advance accelerator science and technology. Access to KIT-based accelerators via IBPT is augmented by European transnational access via ARIES (Accelerator Research and Innovation for European Science and Society) for accelerator researchers and via CALIPSOplus for small and medium-sized enterprises (SME), and by European technology infrastructures such as AMICI (Accelerator and Magnetic Infrastructure for Cooperation and Innovation). AMICI at KIT can be reached via amici∂ibpt.kit.edu. ATP provides a central access-point for large-scale accelerator projects to KIT-based accelerators (KARA, FLUTE) and Know-How located at KIT institutes (IANM, IAR, IBPT, IHM, IMS, IMT, IPE, IPQ, ITEP, ITIV, ITTK, LAS, SCC). The development of compact accelerators goes hand in hand with the development of compact magnetic structures. One example is the superconducting transverse-gradient undulators developed at KIT, which facilitate the construction of compact free-electron lasers based on laser-wakefield accelerators. Photo: (left) ball pen for size comparison. Special coating methods, surface treatments, exquisite thermal and mechanical design are the prerequisite for vacuum chambers of high intensity beams. For the 100-km long Future Circular Collider (FCC) at CERN to advance beyond current LHC energies up to 100 TeV, the KIT is currently testing prototype chambers that are irradiated with synchrotron radiation produced by the storage ring KARA. Photo: prototypes developed in the European project EuroCirCol within Work Package 4 (WP4). Lasers are pivotal in many areas of accelerator development. High-power lasers are essential for laser-wakefield accelerators and laser-driven dielectric accelerators. The installed "split-ring resonator" (SRR) in FLUTE requires high-power laser-generated THz radiation to deflect electrons. Lasers enable high-precision synchronization processes at sub-femtosecond level and precise beam diagnosis with highest resolutions. The latest findings in materials science play a decisive role, while even higher resolution requirements push the development of new materials forward. Photos: fiber laser, electro-optic crystal used in electron bunch diagnostics, femtosecond laser. In accelerators such as FLUTE, the electron packages (bunches) are so short that current beam diagnostics is insufficient to temporally resolve these bunches or the emitted photon pulses. A short pulse in time corresponds to a wide spectrum in the terahertz (THz) range. This is why ultra-fast detector systems, such as the world’s fastest high-temperature superconducting detectors developed at KIT, can determine the pulse length indirectly via the radiation spectrum. Multi-element, high-sensitivity sensors, line- and focal-plane detector arrays provide ultra-fast single-shot spectrometers for extremely wide-band THz pulses simultaneously operating at high repetition rates. Photos: yttrium barium copper oxide (YBCO) terahertz detector (single element and single-shot 4-channel spectrometer, images: IMS), niobium nitride (NbN) superconducting detector within cryostat. KIT has the expertise to build and characterize the structures used for novel acceleration methods at the Karlsruhe Nano Micro Facility (KNMF). At KIT, the KNMF offers access to a uniquely complete set of fabrication and characterization technologies. Such technologies are the prerequisite for dielectric accelerators and split-ring resonators and available on-site. Further KIT technologies promote the development of new radiation sources (for example, nano-undulators) or printed magnets for compact accelerators. Photo (KNMF): silicon grating structure. 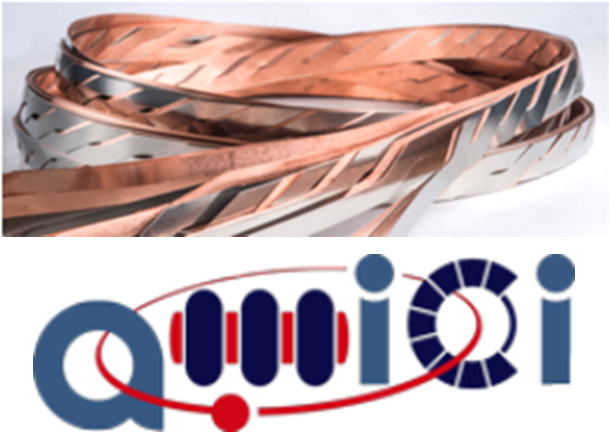 The KIT developments of ultra-fast read-out electronics for signals with high repetition rates (KAPTURE and KALYPSO families) are already installed at national and international accelerators. Also of increasing importance is the online evaluation of large amounts of data generated by the sensor networks used in current accelerators. GPU computing and deep learning methods are employed to handle and analyze the vast amount of data efficiently. These technologies are essential for the development of autonomous accelerators. Image (IBPT): spectrogram of coherent synchrotron radiation in the terahertz range using KAPTURE, photo (IPE): KALYPSO technology, InGaAs or Si line-arrays with several MHz frame rates. KIT is characterized by leading European developments in cryogenics and superconductivity. Examples of this are the development of magnet technology (“Roebel cables”) for LHC upgrades and superconducting insertion devices developed in conjunction with industry. Microwave and pulsed pulse technology play a crucial role in the development and construction of particle accelerators. Methods of quasi-optical beam transport and power coupling, as developed at the KIT for fusion reactors, can help to overcome fundamental difficulties in the field of new acceleration technologies with terahertz radiation and dielectric structures. The development of compact beam diagnostics applications is envisioned and fostered by these competences at KIT. Image, photo (IHM): simulation of quasi-optical beam transport, gyrotron laboratory. Any optimization of accelerators or acceleration processes requires detailed model calculations of all components and relevant processes with numerical and simulative tools. Here too, high-performance computing technologies play an important role. Approaches to solving inverse problems from mathematics help to interpret observations in the accelerators and to create new observables that promote the automation of accelerators. Image: phase-space simulation of electrons. Imaging plays an important role, not only in the application of accelerator-generated radiation, but also in the visualization of processes and dynamics occurring in particle and electron bunches. Multi-dimensional methods, such as tomography as well as micro- and nano-spectroscopy, are powerful tools with close links to mathematics and high-performance computing. Conversely, techniques used in the reconstruction of physical processes in an accelerator again stimulate the generic method development and thereby make important contributions also to other fields of science. Image: tomography of the electron source, which is installed in FLUTE.